Have you ever tried to copy information from a web page or a MS Word document and got more than you bargained for when you pasted it into another Word document or web page? Text often comes with unwanted junk in the form of extra formatting codes. The solution is usually to use Paste Special and then choose to paste as Plain Text or Unformatted text. Word actually gives you an opportunity to also choose whether you want to paste using the sources formatting -- where you got the content from, target formatting -- uses the formatting in the current document, or Unformatted Text where it will only keep the text and discard all formatting. This isn't always a convenient option when all you want to keep is the text without the formatting. First, it requires extra steps. Some applications don't even have a Paste Special option. Did you know that you can actually paste just the plain text into most applications by simply pressing Ctrl-Alt-V (instead of just Ctrl-v). In fact, this works not only on Microsoft Windows but you can press Command-Shift-Option-V in Apple's Mac OS X. This works in almost all applications. One glaring exception is Microsoft Word. However you can simply press ALT-E and then S to bring up the Paste Special dialogue box. 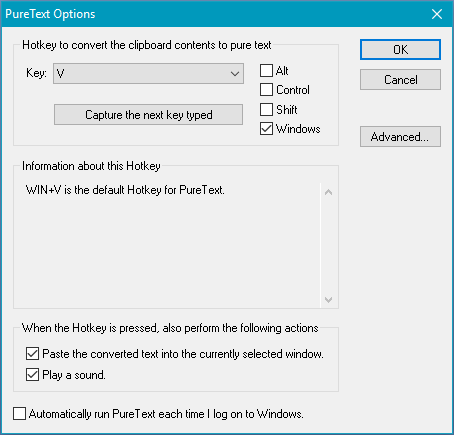 A more universal solution is to give a tool called PureText for Windows a try. When you first run it, it will create a new keyboard shortcut, Win-V.
You can of course change this to almost anything you like. As long as PureText is running, you will be able to press Win-V to paste as plain text into any application. Note that, unlike Ctrl-Alt-V which preserves both the rich and plain versions of the text on your clipboard, PureText will convert the content on your clipboard to plain text as you paste. But what if you don't want to get rid of everything? For example, you might want to keep links, bold, italic, lists, etc? Haven't found a tool to allow you to paste clean HTML yet directly but there are online tools available that will make the job a whole lot easier. 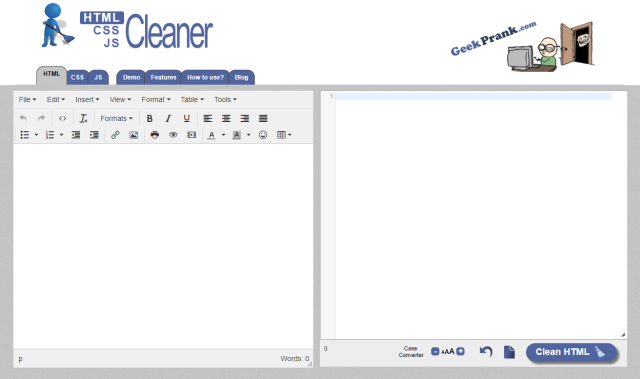 HTML Cleaner is an excellent tool for copying text from a Word document, PDF, email, Web page and more and turning it into nice clean HTML. Tip: You can paste to the editor or the source code window and click Clean HTML to clean up the source code. Once you've converted your code into clean HTML, copy it to the clipboard and head on over to FreeFormatter. I find it does an excellent job of formatting HTML, complete with well indented markup. After using HTML Cleaner and FreeFormatter, it is rare that I need to adjust the resulting junk free HTML, except to add things that I wanted to include and takes only a few seconds.